When a woman is pregnant, there are some things she needs to avoid like foods associated with listeria, recreational drugs, smoking caffeine, toxoplasmosis and salmonella (see the list of things to do and to avoid during pregnancy). However, depending on whom it is you are talking to, there are some things that are safe or unsafe for a pregnant woman as they can make her too nervous to do much. Nowadays, not a day goes by that the media does not report some bad news on the environment. This makes pregnant women more sensitive than they already are when they think about things that could harm their unborn baby. One of the many things pregnant women worry about is whether the products they use to clean are safe for their baby. Here is some useful advice on cleaning with bleach while pregnant. Cleaning with Bleach While Pregnant, Is It Safe? According to the American Pregnancy Association, most cleaning products are safe to use during pregnancy including bleach. So, if you are pregnant, there is no need to hire cleaning help unless you need it. However, there is likelihood that some cleaning products have smells that might cause nausea. If you will be handling all the dirty work, here are some steps you should take whenever you clean with bleach while pregnant. This way, you will be able to protect yourself and the baby from any harm and keep you and your baby healthy. Step 1: Ensure that the area you are cleaning has good ventilation. Step 2: Wear protective clothing and gloves to protect the skin. Step 3: Before you use a cleaning product, first read the instructions and warning labels. Step 4: Do not mix chemicals like bleach and ammonia - this mixture is quite dangerous when inhaled. Step 5: Try as much as you can not to clean your oven. The reason for this is that the space is tight, and ventilation is poor. Step 6: Use Aerosol cleaning products but not routinely because they spread chemicals in fine mist, which makes it more likely for you to inhale. If you use fumes that make you feel sick, ask for help with the cleaning. You can easily make products that are non-toxic by using basic on-hand ingredients. Baking soda helps you to remove stains, eliminate odors and is a wonderful scouring powder. White vinegar comes in handy as an all-purpose cleaning product. It comes with a bonus for cleaning as a bacteria and germs killer. Club soda is also a good polisher and stain remover, while olive oil is a good furniture polisher. Hydrogen peroxide can work as a stain remover or bleach (non-toxic, and disinfectant). Borax is a wonderful alternative to bleach and helps to get rid of odor, deodorizes, disinfects and removes dirt. How to make: Combine some liquid non-toxic soap with 2 tbsp. vinegar and a tablespoon of borax in an aerosol bottle and add some hot water. Shake the mixture well until all the borax has been dissolved then add some more liquid soap. Precaution: It is worth noting that there are some people who add essential oils to homemade cleaner for the scent. However, pregnant women should avoid some essential oils because there are some that potentially have dangerous side effects in pregnant women. See the list of essential oils for pregnancy here. Some household products, nitrobenzene and antibacterial soaps. It is not possible to avoid cleaning product chemicals completely. There are some chemicals that have been associated with probable health complications like Triclosan. 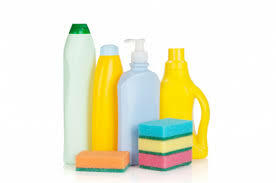 Triclosan can be found in some household products, nitrobenzene in some furniture polishes and antibacterial soap. Try not to do dry cleaning. Commercial dry cleaners mostly use PERC (perchloroethylene). There are some studies that have linked PERC to increased risks of miscarrying. You can instead hand-wash all the delicates or have someone dry-clean for you. Check your crystal, ceramic dishes and pottery. There are some serving pieces that may contain lead. Check if your favorite pieces have lead by using a lead test kit. The Cat’s litter box. A cat’s feces have a parasite known as Toxoplasma gondii. This parasite can cause a grave blood infection called toxoplasmosis. If you do have a cat, ask someone else to clean the cat’s waste box for you.